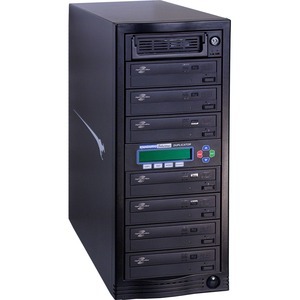 Increase productivity and decrease costs with the Kanguru DVD Duplicator with built-in hard drive! A built-in hard drive allows you to store commonly duplication jobs internally for faster production times. You can copy disc images from a PC or Mac to the duplicator's hard drive through USB connection. Not as loud as I thought it would be. We are producing CD''s/DVD''s in half the time of our old model. Copying 6 CD''s in a little over 3 min''s. Great value. Very pleased! Have not yet identified cons.